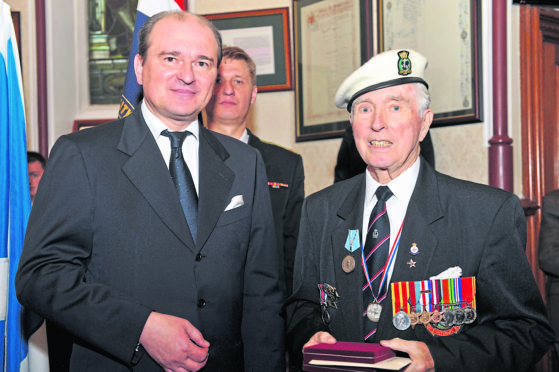 Presentation of the Ushakov Medals to veterans of the Arctic Convoys of WW2 at the Town House, Inverness. 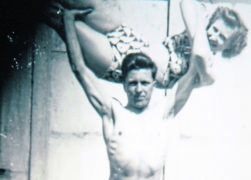 But the flame of life that kept Bill Shand going to the age of 93, lifting weights and telling stories, went out this week. Bill was born on March 30, 1925, into the Inverness home he shared with grandparents, parents and an older sister Margaret. His son, Eric, said; “As a child my father’s playground was the old slaughterhouse, Cromwell’s Citadel and the harbour shoreline. Bill Shand holding his wife, Margaret. Aged 17, he joined the Navy and became part of the Arctic Convoys, missions which helped turn the tide of war into an Allied victory. “They got pulled out of the convoys and sent to London where they learned they’d been recruited for the highly secretive D-Day invasion. “Dad was a wireless operator and his ship was despatched to Arramanches. When hostilities ceased he worked in Whitehall for 18 months before returning to Inverness in 1947 and a year later joined the Highland Fire Brigade, rising to the rank of Firemaster. “Big incidents during his time included The Playhouse Cinema in Inverness burning down,” said Eric. “Dad said he was the last one out of the building. “There was also a huge forest fire in Carrbridge which closed the railway line and A9 and was so fierce they lost a fire engine and had to run for their lives. Post-retirement, he was a local councillor for Nairn. “He and former provost, Sandy Park took the first Highland games to Moscow and he was a great supporter of the children of Chernobyl visiting here.” said Eric. Bill Shand died on November 11 and is survived by his wife Margaret, sons Martin, 62, and Eric, 56, daughter-in-law Susan, and grandchildren Matthew, Laura, David, Sam, step-grandson Finlay and great grand-daughter, Jess. His funeral will take place on Wednesday at Nairn Old Parish Church.